1. Keep documents readyBefore you file, keep all your documents handy so you do not need to look for an important piece of paper every two minutes. For quicker filing, keep all your old tax receipts, receipts of income and investments, Form 26AS, Form 16, bank documents etc. in order. Also, do keep them safe after you have filling out the form online - they will be needed if an Assessing Officer (AO) asks for proofs. Go over your tax documents carefully before do your calculations. Then, make sure all your calculations are correct and recheck the numbers. You can even use an e-filing software to ensure accuracy. The point here is that wrong numbers would mean wrong taxes and that will cause troubles later on. Gains from mutual funds can be tax-exempt, and you might think it's okay to not mention these. However, filing your ITR requires full disclosure of all income that you earn from various sources; irrespective of whether this income is taxable or exempt. Hiding information can cause legal heartaches so it's better to be honest. After you have e-filed your income tax return, you will have to e-verify your ITR-V. This can be done via Netbanking, Aadhaar Card or through the Electronic Verification Code process on your mobile number and email. Do not skip this step, because the income tax department will only start processing your returns post receiving the verification. You can also sign and send a physical copy of the ITR-V to the Central Processing Centre (CPC), via ordinary or speed post only. This must be done within 120 days from the date of e-filing of tax return. You will need to fill in your bank details (account number, IFSC code, name as per bank records etc. 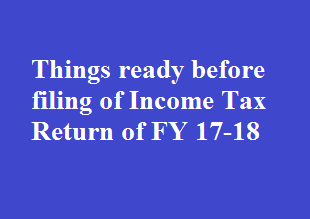 ), PAN number, postal address, and email id in the ITR form. Incorrect details can again lead to problems in the return being processed. You may also not be able to receive important communications from the tax department like refund cheque, error notices etc. The Section 80C is best way to reduce your tax liability. So, make use of the deductions offered under this section to fullest. Even if you were not able to submit proof of investment to your employer earlier, you can still claim the deductions while filing the ITR, however keeping all proofs safely is very important, should the AO ask for them later.